How to change this company name display for individual widgets to widget name? If you make multiple widgets for different websites and clients, you'll notice that the company name is persistent across different companies. How do I change from company name to widget name? 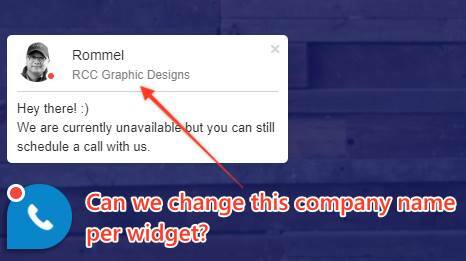 There is a way to change the widget display, from company name to widget name. This will allow each of your widgets to display different names, which means you can use it for different websites and different clients. Switch from "Account Company" to "Widget Name".